Morning all just popping in to show you my card for this weeks LIM challenge. I meant to enter last week but the week disappeared so quickly and I was busy making cards for forthcoming birthdays. I used freebie stamps from Creative Stamped magazine, gold embossed the dress and used glitter ep for the clapper stamp. Watercolour pencil and water brush to colour the dress. I bent some wire for the hanger and added some gems at the neckline. Hope you all have a crafty week! Gorgeous card! I'd been thinking about a wire coathanger but I don't have a dress image as perfectly suited to CAS as yours is! beautiful card, val... clever to create your own hanger for your glamorous dress!! Great card and clever use of the wire for the hanger. That's one set of stamps I managed to resist for once!! Hi Val, what a gorgeous dress beautifully coloured and love her gems great sparkle. Clever you making a hanger, love it. Fab card - very glam! A beautiful elegant card Valerie, love your design. Great minds think alike! I love your card especially the film clapper board. Inspired by the Oscars? The moment is right, as is this classy style, that's for sure. The dress hanger wire is SO clever and a fabulous little detail! 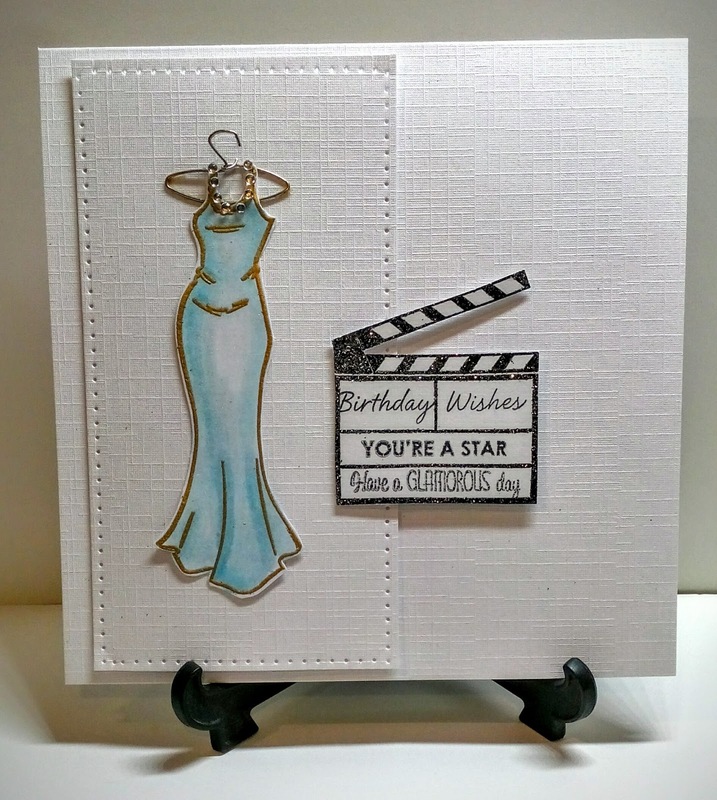 Love the elegant design of the dress and your textured card base. Really clever use of wire and I love the addition of the gemstones. Well, who wouldn't love such a super slinky dress? (Sigh - those were the days!) 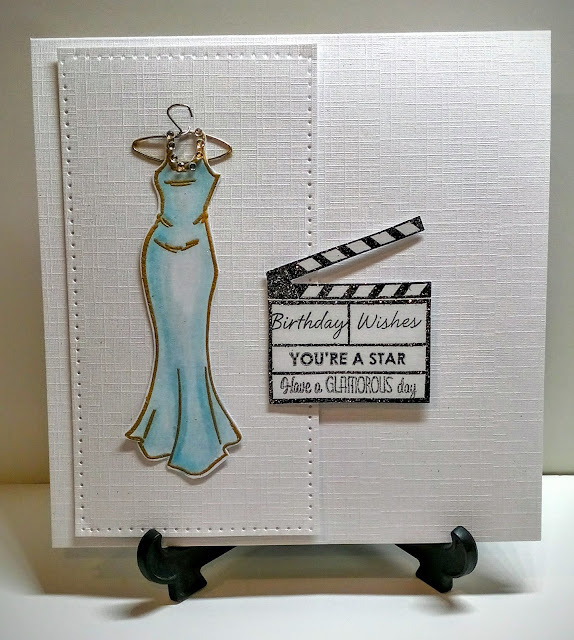 Your card is elegant with a fun twist using the clapperboard. Super use of wire too. And you even incorporated a freebie! What's not to love?! Thank you for joining us this week at Less is More. This is very slinky Val and I had completely forgotten about making a coat hanger with wire... brilliant! Val this is so stylish! Great take on the challenge theme and your freebie stamps are super.